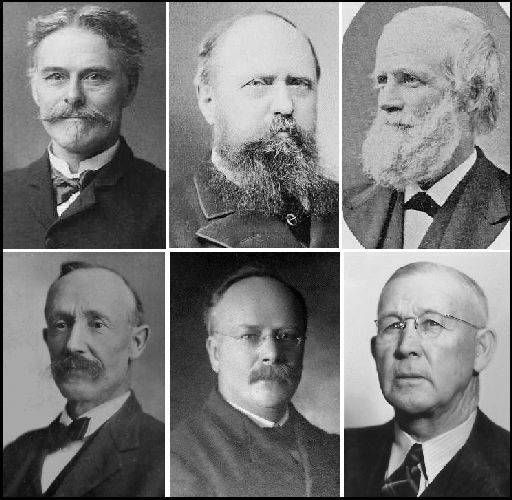 LEFT: The first paleontologists in Kansas: Upper row, left to right: E.D. Cope, O.C. Marsh, B.F. Mudge; Lower Row: C. H. Sternberg, S.W. Williston, G.F. Sternberg. 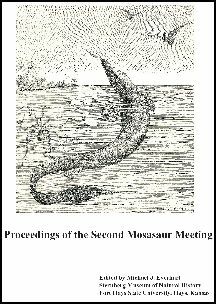 Join Cope, Marsh, Mudge, Williston, the Sternbergs, H. T. Martin and the many others who have reported on fossils from the Midwest. Beckemeyer, R. J., Research Associate, Natural History Museum Entomology Division (Paleoentomology), University of Kansas. THE EARLY PERMIAN INSECT FAMILY LEMMATOPHORIDAE SELLARDS, 1909 (SENSU STOROZHENKO, 1997). Species of the Polyneoptera family Lemmatophoridae Sellards, 1909 are a diverse and abundant component of the Wellington Formation of Kansas; four of the six species of insects from the Elmo, Kansas deposits with over 100 specimens each are lemmatophorids. Lemmatophoridae have also been documented from Early Permian localities in Germany (Hornschmeyer, 1998) and Russia (Zalessky, 1952; Novokshonov, 2000; Aristov, 2001, 2004; Aristo et al., 2006). 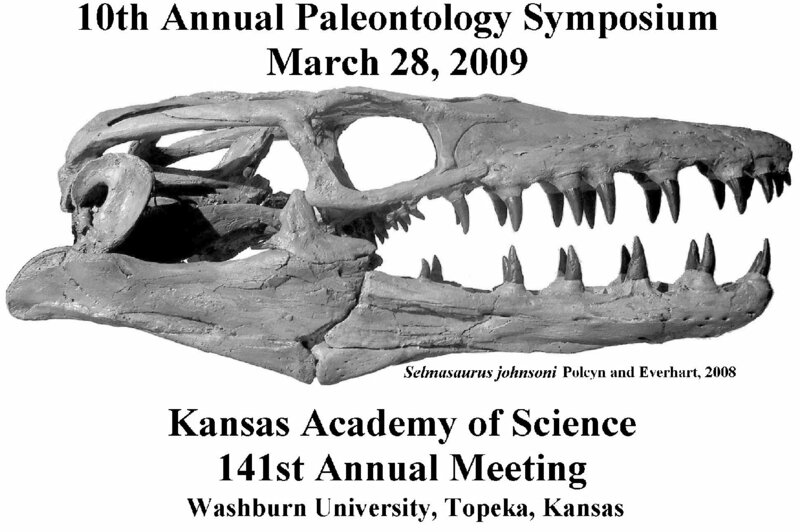 The systematic paleontology and biogeography of the family is briefly reviewed and the distribution of Wellington Formation species in Kansas and Oklahoma is reported. Of eight species of Lemmatophoridae known for the Wellington Formation, five are common to Kansas and Oklahoma and three are unique to Kansas. DePalma, R. A. (2), Department of Paleontology, University of Kansas. A PRELIMINARY STUDY OF THE USE OF CYANOBACTERIA IN A NOVEL APPROACH TO FOSSIL PREPARATION. The field of fossil preparation has changed little in the last hundred years. While slight advancements have been made in the stabilizing polymers and hand tools, the process by which matrix is removed from delicate fossils has remained virtually unchanged. In this study the cyanobacterium Hyella sp., a known contributor to the biological weathering of rocks, and the gastropod Neritina reclivata are tested in a possible new technique to remove carbonate matrix from very delicate fossil specimens. The effect of cyanobacterial degradation of rocks is well known, however the use of cyanobacteria to enhance the preparation of fossil specimens is a new and unexplored field of paleontology. In this study, the combined effects of microscopic and macroscopic organisms on fossil bone-containing rock samples were examined. The coupling of macroorganisms with microorganisms produced greater matrix-removing results than either accomplished individually and damage to fossil bone samples was not observed. Everhart, M. J. Sternberg Museum of Natural History, Fort Hays State University. NOTE ON A PLESIOSAUR SPECIMEN FROM THE KIOWA SHALE (EARLY CRETACEOUS; MIDDLE ALBIAN) OF KIOWA COUNTY, KANSAS. The well-preserved, nearly complete left ischium of a small plesiosaur was collected by the author from the basal Kiowa Shale near Belvidere, Kansas in August, 2008. It occurred approximately 0.5 m below the first major bentonite in the lower Kiowa Shale (Early Cretaceous; Upper Albian; Venezoliceras kiowanum Zone), and about 4 m above the basal Champion Shell Bed. The specimen (FHSM VP-17302) represents a plesiosaur that was 3-4 m in length. Another ischium (FHSM VP-2984) is similar in size but appears to represent a different taxon. Plesiosaur remains are the most common of any of the marine tetrapods from the Kiowa Shale and have been collected from Kiowa and Clark counties since the 1890s. More recently their remains also have been discovered in McPherson County. 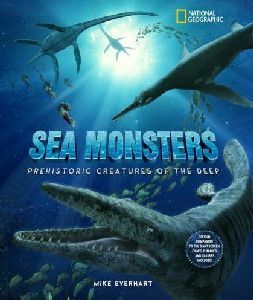 While the remains of these early plesiosaurs are well-represented in the collections of the University of Kansas Museum of Natural History (KUVP) and the Sternberg Museum of Natural History (FHSM), few of the specimens are reported in the literature. The type specimen of Plesiosaurus mudgei(KUVP 1305), including limb bones, vertebrae and gastroliths, is figured in a 1903 photograph by Williston. Further study of these historically collected specimens is hampered by the lack of associated stratigraphic information. The collection of future specimens with accurate field data is important to our understanding of the occurrence of marine vertebrates from the Early Cretaceous in Kansas. Everhart, M.J. and G. Pearson, Sternberg Museum of Natural History, Fort Hays State University. 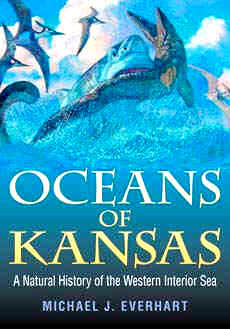 FIRST REPORT ON A MARINE TURTLE FROM THE FAIRPORT CHALK MEMBER OF THE CARLILE SHALE OF MITCHELL COUNTY, KANSAS. The type specimen of the giant protostegid turtle, Protostega gigas, was collected by E.D. Cope from the Niobrara Chalk in 1871. Since that time, numerous specimens of this and other turtle species have been collected from western Kansas. Although turtle remains are known from as far back as the Early Cretaceous (Kiowa Shale) in Kansas, specimens other than those from the Niobrara are generally rare and usually fragmentary. The type specimen of another protostegid turtle, Desmatochelys lowii (KUVP 1200), was collected from the older Fairport Chalk (Late Cretaceous; Middle Turonian) near Fairbury in south central Nebraska in 1893, but in general the remains of turtles are rare and fragmentary in the entire Carlile Shale Formation. In September, 2008, the authors collected the anterior skeleton of a large marine turtle in situ from a roadside exposure of the Fairport Chalk in Mitchell County, Kansas. The remains consist of a complete skull and mandible, cervical vertebrae, a complete left front limb, elements of the right front limb, and anterior portions of the carapace, including the nuchal. The missing portion of the skeleton suggests that the turtle was bitten by a larger predator, possibly the pliosaur Brachauchenius lucasi. So far as can be determined, this specimen includes the first turtle skull collected from the Fairport Chalk in Kansas. While the specimen has been provisionally identified as Desmatochelys, there are some differences noted between the humeri of the type as figured by Williston (1894) and the new specimen. Falk, A. R.1 (2) and L. D. Martin,2 1Department of Geology, University of Kansas, and 2Museum of Natural History, University of Kansas. DETERMINING MESOZOIC BIRD TRACKS WITH BEHAVIORAL CRITERIA The first discoveries of North American Mesozoic tridactyl tracks were named Ornithichnites and were hypothesized to have been made by large birds (Hitchcock, 1836). These tracks are from the Lower Jurassic and are now considered to have no known tracemaker (Rainforth, 2002). One of the criteria for distinguishing bird tracks from dinosaur tracks is the presence of a reflexed hallux (Lockley et al., 1992). Other criteria used to identify bird tracks include the length:width ratio (Currie, 1981), claws II and IV curving away from the midline of the foot, and the angle of divarication between toes II and IV (110-120o in birds) (Lockley et al., 1992). These morphologic criteria are satisfactory for many Mesozoic trackways. In ambiguous cases, behavioral aspects of modern shorebirds may assist in distinguishing bird trackways from dinosaur trackways. Theropod dinosaurs leave straighter trackways going directly from one place to the other, whereas birds usually leave a more sinuous trackway where the vector of overall movement may be difficult to determine. An individual bird will often overstep its own tracks while this is rare or absent in theropod dinosaurs. Evidence of flight such as takeoff or landing traces provides confirmation of an avian origin. Foraging traces such as probe, scrape or dabble marks may also show characteristic avian behavior. Using behavioral interpretations, trackways such as Trisauropodiscus and other questionable Jurassic tracksites may be revisited and potentially re-interpreted. Hamm, S. A. THE OCCURRENCE OF PTYCHODUS RUGOSUS (PTYCHODONTIDAE) IN THE WESTERN INTERIOR SEAWAY AND GULF COAST. Tooth specimens previously ascribed to the Late Cretaceous shark Ptychodus anonymus Williston (1900) from the Smoky Hill Chalk Member of the Niobrara Chalk are re-diagnosed as Ptychodus rugosus Dixon (1850) based on comparisons with the type specimen from the English Chalk. Ptychodus rugosus differs greatly in morphology from P. anonymus in regards to tooth size, occlusal ornamentation and stratigraphic occurrence. Although it is a rare taxon in North America, being present only in Late Coniacian deposits in Kansas and Santonian deposits in Alabama and Texas; most specimens are represented by relatively complete tooth sets from varying ontogenetic stages. Morphometric data obtained from these tooth sets provides information regarding the changes in dental morphology through ontogeny. Post cranial skeletal elements consisting of dermal denticles and calcified vertebral centra are associated with a juvenile and an adult specimen of P. rugosus and offer clues to the body form this taxon possessed. Hoffman, B. L., C. E. Hoffman, and S. A. Hageman, Department of Natural and Physical Sciences, Park University. MICROICHTHYOLITHS AND CONODONTS FROM THE QUINDARO SHALE AND ARGENTINE LIMESTONE OF THE KANSAS CITY GROUP. The Quindaro Shale (15 cm thickness) and Argentine Limestone (5.5 m thickness) Members (Wyandotte Limestone, Kansas City Group, Upper Pennsylvanian System) are marine regressive sediments prominently exposed at Park University, Parkville, Platte County, Missouri. Microremains from this locality were separated from Quindaro Shale soaked in water or from Argentine Limestone treated with 10% acetic acid. The sediments were then examined with a dissecting microscope and 3128 specimens isolated. Remains from several groups of fishes are evident, including chondrichthyans (sharks and acanthoid fishes), bony fishes and craniates (conodonts). Teeth from Gunnellodus belistriatus, Gunnellodus cameratus and Gunnellodus trispinosus, which resemble cephalic and branchial denticles from stethacanthid sharks are found throughout the two members and represent 11% of identified fish remains. Teeth similar to Zangerlodus williamsi (1%) and cladodont-style teeth (1%) are also found. Listracanthus denticle fragments account for another 1% of fish remains. Other shark remains include placoid scales (17%) previously referred to several form genera (Cooleyella, Cooperella, Fortscottella, Hammondella, Kirkella, Moreyella, and Williamsella). Scales and fin spines from acanthodian fishes are commonplace (20%). Isolated teeth, teeth in jaw fragments and scales of bony fishes are also numerous (15%). Present, but rare, are teeth from petalodonts and tooth plates similar to lungfish. Conodonts are common (34%), including Idioprioniodus and Streptognathodus from the Quindaro and Streptognathodus, Idiognathodus, Hindeodus, and Adetognathus from the Argentine. The conodont distribution also indicates a transition from open ocean to shallow nearshore paleoenvironments. This marine regression is likewise evident from examination of associated invertebrate fossils. Martin, L. D. and T. J. Meehan, Museum of Natural History and Department of Ecology and Evolutionary Biology, University of Kansas, and Chatham College, Pittsburgh, PA. AN ASTRONOMICAL STRATIGRAPHY. A recent paper by van Dam and others extends the stratigraphic use of the Milankovitch orbital variations to include a 2.4 million year climatic cycle or roughly the duration of a marine zone. Previously the Milankovitch cycles provided an explanation for the hundred thousand year fluctuations seen in ice ages. Van der Hammen in the 1950s recognized a climatically induced cyclicity in the fossil record with individual units having about the duration of a marine zone and these units grouped into bundles of three repeating cycles near the average duration of a marine stage. A similar pattern was recognized by Martin in 1985 using North American Land Mammal Ages. Van der Hammen concluded that these cycles were the ultimate basis of global biostratigraphy and Martin and Meehan in 2005 concluded that they influenced the patterns of evolution found in the fossil record. Melott has recently supported a larger cycle of around sixty-two million years a scale close to the average for a geological period. We thus have potential astronomical explanations for most biostratigraphic patterns and wonder if it would make sense to base time stratigraphic units on the astronomical scales forming a kind of calendar for earth history. Because of the repetitive nature of the astronomical controls, some aspects of climate change and evolution might be predictable. Melott, A. L., Department of Physics and Astronomy, University of Kansas. A STRONG, 62 MYR BIODIVERSITY CYCLE COMMON TO THE SEPKOSKI AND PALEOBIOLOGY DATABASES. After decades of tantalizing partial results, the existence of periodicity in fossil biodiversity has finally been put on a firm statistical basis: there is a significant 62 Myr cycle in fossil biodiversity. I present a new analysis of the Paleobiology Database, which agrees with a previous detection by others in the Sepkoski Database. This cycle agrees in both period and phase with the oscillation of the Sun normal to the Galactic disk, in the sense that biodiversity minima coincide with excursions to Galactic north. I suggest an effect based on the generation of cosmic rays at shock waves due to large-scale motions in the Local Supercluster of galaxies. I discuss the evidence for these periodicities and possible mechanisms to affect biodiversity. 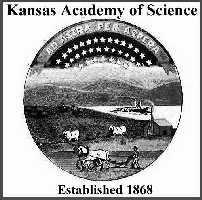 Mickle, K. E. (3), Department of Ecology and Evolutionary Biology, Natural History Museum and Biodiversity Research Center, The University of Kansas. THE LOWER ACTINOPTERYGIAN FAUNA OF THE MANNING CANYON SHALE FORMATION (UPPER MISSISSIPPIAN, LOWER PENNSYLVANIAN) OF UTAH. The Manning Canyon Shale Formation of Central Utah (Upper Mississippian-Lower Pennsylvanian) is well known for its diverse Carboniferous flora but not its vertebrate fauna. The previously described vertebrates from the Manning Canyon Shale Formation are an acanthodian and two microsaurs. Lower actinopterygian scales and isolated bones have been mentioned in the literature, but until now, articulated actinopterygians have not been officially described. Here, the actinopterygian ichthyofauna of the Manning Canyon Shale Formation will be described for the first time. Three new species of lower actinopterygian fishes are described. The new fishes consist of two new species of palaeoniscoid fishes as well as a new species from the order Aeduelliformes. It is important to note that this is only the second occurrence of an aeduellid fish in North America and that this discovery supports current biogeographical and paleoecological findings of a marine connection between North America and Europe. It is also important to note that though there have not been many specimens of actinopterygians collected from the Manning Canyon Shale Formationthere are less than a dozen specimens available for study; those that have been collected have been found to be very different from each other and have uncovered a previously unknown diversity. Nabavizadeh, A. (1), Department of Ecology and Evolutionary Biology and University of Kansas Museum of Natural History (BRC), University of Kansas. A POSSIBLE KEY TO THE SUCCESS OF ORNITHISCHIAN DINOSAURS. The predentary bone is a diagnostic feature of ornithischian dinosaurs. It is connected anteriorly to the paired dentary bones of the mandible and casts of the original soft tissue show that a keratinous bill resembling that of modern turtles covered it. It has been proposed that this bill assisted in nipping off vegetation, acting like the incisors of herbivorous mammals. It seems likely, however, that the predentary bone acted as an axial point permitting the two dentaries to independently shear vegetation laterally. Studies have suggested Heterodontosaurus used a similar mechanism (Weishampel, 1984; Crompton, 1986). Hadrosaurs have a distinct curvature on the anterior region of the dentaries that suggests a rotating surface at the dentary-predentary junction and a kinesis similar to that of Heterodontosaurus. The posterior region of the mandible (including the articular) has an upturned concavity articulating with the ball-shaped ventral surface of the quadrate bone. In ceratopsians, there is also a similar junction, but unlike hadrosaurs where the dentary appears to have been able to roll, the ceratopsian predentary is concave with the flat expansion of the dentary lying against it so the dentaries could pivot almost vertically. These movements provide a variety of shears that may serve a similar function but are unlike the masticatory movement seen in mammalian jaws. Rothschild, B. M., Biodiversity Research Institute, University of Kansas. STRESS FRACTURES IN CERATOPSIA: NOT JUST FOR PEDIOPHILES. Stress fractures, which commonly afflict ceratopsian phalanges, have been attributed to migration activities, similar to the march fractures found in athletic and military recruits subjected to unaccustomed physical stresses. Recent evidence suggests an additional location, with a different implication. Linear patterns of periosteal reaction were present on the external surfaces of jugal, squamosal and parietal elements of Triceratops and Centrosaurus. Erroneously attributed to acute trauma in the past, this pathology actually represents stress fractures. The en face macroscopic appearance and the standard x-ray appearance of this linear periosteal reaction are diagnostic for stress fractures. Occasional presence of a linear surface cleft further substantiates that perspective. Absence of peri-lesional disorganized bone reaction rules out infectious disease, the only major differential diagnostic consideration. Stress fractures result from repetitive stresses, not a single traumatic event. These stresses individually cause minor disruption of bone structure. If the rate of repair does not keep pace with the rate of disruption, stress fractures result. Minor bone structure disruption is also part of the normal growth process. Much of bone reshaping seems to represent a process of stress (e.g., muscle)-induced plastic deformation. When that plastic deformation proceeds faster than the repair, stress fractures occur. It is hypothesized that the observed linear reaction in ceratopsian skull elements may simply represent part (although exaggerated) of normal growth or at least that the process of repair could not keep up with the stress-induced changes of remodeling. This is parsimonious with the variation in general frill morphology that characterizes ceratopsian ontology. Shimada, K.1,2,3, and M. J. Everhart3*. 1Environmental Science Program, DePaul University, 2Department of Biological Sciences, DePaul University, 3Sternberg Museum of Natural History, Forth Hays State University. THE FIRST RECORD OF THE LATE CRETACEOUS PYCNODONT FISH, ANOMOEODUS BARBERI, FROM THE NIOBRARA CHALK OF WESTERN KANSAS. We describe the first occurrence of the Late Cretaceous pycnodont fish, Anomoeodus barberi Hussakof, from the Niobrara Chalk in western Logan County, Kansas. The specimen is an incomplete right prearticular tooth plate that was surface collected from the upper Smoky Hill Chalk (Lower Campanian), and represents the second and the youngest occurrence of this species from Kansas. The addition of A. barberi to the fauna of the Smoky Hill Chalk increases the total number of pycnodont taxa to four, bony fish taxa to 56, and total fish taxa to 72. Spears, S. Z. (2), Department of Geology, University of Kansas, A. R. C. Milner, St. George Dinosaur Discovery Site at Johnson Farm, St. George, UT, D. Ferris-Rowley, Bureau of Land Management, St. George Field Office, St. George, UT. ESTABLISHING THE NATIONS FIRST PALEONTOLOGICAL SITE STEWARDSHIP PROGRAM IN WASHINGTON COUNTY, UTAH. With the increase of fossil theft from state- and federally-administered lands, protection of the nations paleontological resources has become a prime concern among many groups and organizations. Washington County, Utah, in particular, has become a hotbed of illegal collecting due to the recent discovery of a large dinosaur tracksite in the area in 2000. To combat this dilemma, the Bureau of Land Management (BLM) teamed up with the St. George Dinosaur Discovery Site at Johnson Farm (SGDS) and the Utah Friends of Paleontology (UFOP) to establish a site-monitoring program. Paleontologists conduct field surveys and record paleontological sites. Once evaluated, a paleontological locality is ranked based on site sensitivity and importance, and then placed into a database of sites being monitored by the site stewardship program. All valuable information, including UTM coordinates, maps, geology, and fossils, is then compiled into a site packet, which is given to a trained BLM volunteer. These trained volunteers monitor sites regularly, looking for any signs of theft, vandalism, and natural erosion. Any significant changes are immediately reported to a BLM Law Enforcement Ranger or the SGDS paleontologist. In 2007, site stewards donated nearly 1500 hours of site-monitoring time to the program. Many federal land-managing agencies, who already host volunteer archeological site stewardship programs, can easily incorporate at-risk paleontological localities into their existing programs, thus providing protection to valuable and threatened resources. Sundell, C., Santayana Institute. TEACHING EARTH SCIENCE WITH FOSSILS: AN INTERACTIVE APPROACH. Earth and related physical sciences can be better taught and made more interesting by using real fossil specimens in K-12 school systems. In Sept 2001 a Triceratops skull and 50% skeleton was donated to the Olathe school district (USD 233). Over 3200 8th grade Earth Science students and several hundred high schools students have since been involved in hands-on preparation of the specimen for permanent interpretation, mounting and public display. Students have learned a basic knowledge of stratigraphy, preparation techniques as well as terrestrial paleoecology of the late Cretaceous of the Western US. Subsequent to this work student test score in basic science and math improved, presumably due in part to efforts of Earth science educators coupled with a volunteer paleontologist. Students at the high school level also have an opportunity to interpret the process and specimen during visits of current k-9 students to the project and the display site at the Olathe North Geoscience Center. We hope to establish a series of science clubs under the umbrella of what we call the Smilodon Society open to students and adults in ALL school districts to facilitate extracurricular interest in the Earth and related Physical sciences by students and their parents. Thomas, B. C.1 and A. L. Melott2, 1Department of Physics and Astronomy, Washburn University, and 2University of Kansas. Late Ordovician geographic patterns of extinction compared with simulations of astrophysical ionizing radiation damage. Based on the intensity and rates of various kinds of ionizing radiation events such as supernovae and gamma-ray bursts, it is likely that the Earth has been subjected to one or more events of potential mass extinction level intensity during the Phanerozoic. These induce changes in atmospheric chemistry so that the level of Solar ultraviolet-B radiation reaching the surface and near-surface waters may be approximately doubled for up to one decade. Certain regularities in the latitudinal distribution of damage are apparent in computational simulations of the atmospheric changes. We previously proposed that the late Ordovician extinction is a plausible candidate for a contribution from an ionizing radiation event, based on environmental selectivity in trilobites. In order to test a null hypothesis based on this proposal, we confront latitudinal differential extinction rates predicted from the simulations with data from a published analysis of latitudinal gradients in the Ordovician extinction. We find that the pattern of damage predicted from our simulations is consistent with the data assuming a burst approximately over the South Pole, and no further north than -75°. We predict that any land mass (such as parts of north China, Laurentia, and New Guinea) which then lay north of the equator should be a refugium from the UVB effects, and show a different pattern of extinction in the first strike of the end-Ordovician extinction, if it were induced by such a radiation event. More information on extinction strength versus latitude will help test this hypothesis. Thomasson, J. R., Department of Biological Sciences, Fort Hays State University. EVIDENCE OF SEED PREDATION ON ANTHOECIA OF BERRIOCHLOA TUBERCULATA (POACEAE) FROM MIOCENE OGALLALA SEDIMENTS IN SCOTT COUNTY, KANSAS. My studies at an Ogallala Formation site in Scott County, Kansas have revealed the presence of an abundant Miocene flora that includes reproductive structures of grasses (Poaceae, anthoecia), sedges (Cyperaceae, achenes), borages (Boraginaceae, nutlets), and hackberries (Ulmaceae, endocarps). Grasses are especially abundant and include at least six species from the tribes Stipeae (Berriochloa and Nassella) and Paniceae (Panicum). Fossils were recovered dispersed in sediments or collected as dense aggregations located in tubular to lenticular structures that probably represent burrows of small mammals or arthropods (e.g., harvester ants such as Camponotus or Pogonomyrmex) similar to those I previously described from western Nebraska. Among the grass fossils are anthoecia of Berriochloa tuberculata that show evidence of predation in the form of small, generally circular, holes at the base of lemmas that are interpreted as exit structures. This type of damage is rare in the Cenozoic fossil record and has not been previously been reported on fossils from the widespread Ogallala Formation. Although the seed predator responsible for the holes is unknown, similar damage is formed on floral bracts of the living bromeliad Werauchia gladioliflora by adult phytophagous wasps of Eurytoma weraudia as they emerge from flower buds.